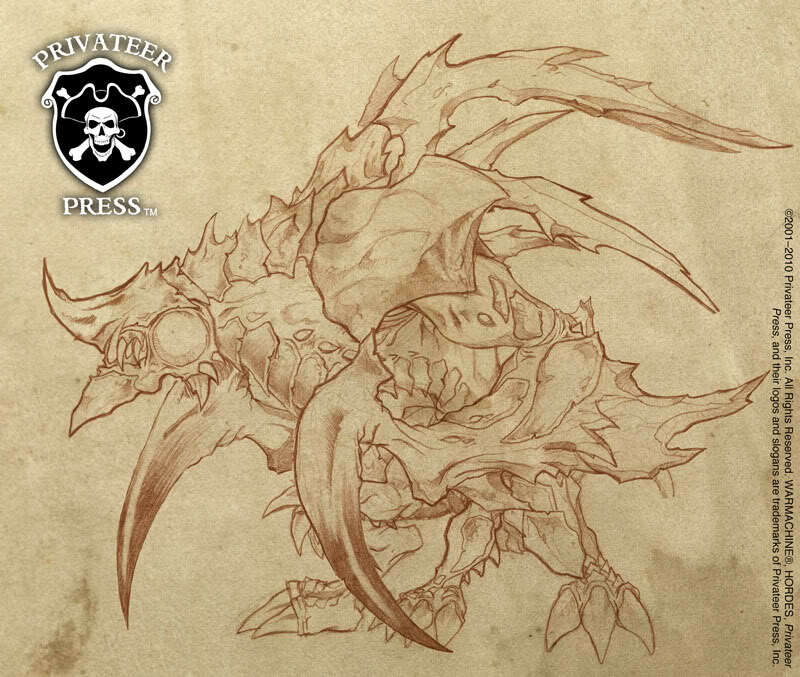 Vylodectes is a Unique Warbeast for the Legion of Everblight for use in the Frozen North campaign. Vylodectes is a masterpiece of Everblight’s ingenuity. It is a vessel for a piece of the Scourge Bringer, an Orgoth-created weapon with the power to destroy a dragon. The merest touch of even a shard of this weapon is enough to corrode dragon and dragon spawn flesh. That Everblight was able to guide and instruct Vayl on how to spawn a living ark to contain it is something he is most proud of. Vylodectes is the last dragon spawn created to house the third and final piece of the weapon. Everblight realised quite early that these unique creatures would have to regenerate the wounds inflicted by their encumbrance. This process produces a caustic bile, a combination of decayed blighted flesh and corrosive Orgoth magics, that must continuously be expelled from the creatures. However, this process cannot last indefinately and without the healing powers of a warlock the creatures would eventually succumb to Scourge Bringer. To stall this decay, and prevent the weapon pieces from reuniting, Everblight has entombed each creature in a glacier separated by hundreds of miles of near impassable mountains. This hibernation suspends the creature in a frozen state. Vylodectes is about to share in the fate of its siblings, Xytodectes and Zyntodectes, and be placed in its icy tomb to be awoken when Everblight wills it. Replace the Dragon Breath ranged attack with Caustic Bile RNG 8, ROF 3, AOE 3, POW 14; Damage Type: Cold and Continuous Effect: Corrosion. Special Rules: Vylodectes must make an attack with Caustic Bile each activation. If for any reason it cannot make this attack (for example it runs) it suffers d3 damage points at the end of its activation. When Vylodectes is forced to make an additional ranged attack it immediately suffers d3 damage points. attacks targeting models in its melee range. Virtuoso – This model can make melee and ranged attacks during the same combat action. When this model makes its initial attacks, it can make both its initial ranged and melee attacks. Regeneration [D3] – This model can be forced to heal d3 damage points once per activation. This model cannot use Regeneration during an activation it runs. Replace the Spiny Growth animus with Excessive Healing (COST 2, RNG Self, AOE -, POW -, UP No, OFF No) – When this model is damaged by an enemy attack, immediately after the this model heals d3 damage points. Excessive Healing lasts for one round. I hope you enjoy fielding this unique creature. All feedback appreciated. It’ll be used in the upcoming Frozen North campaign.